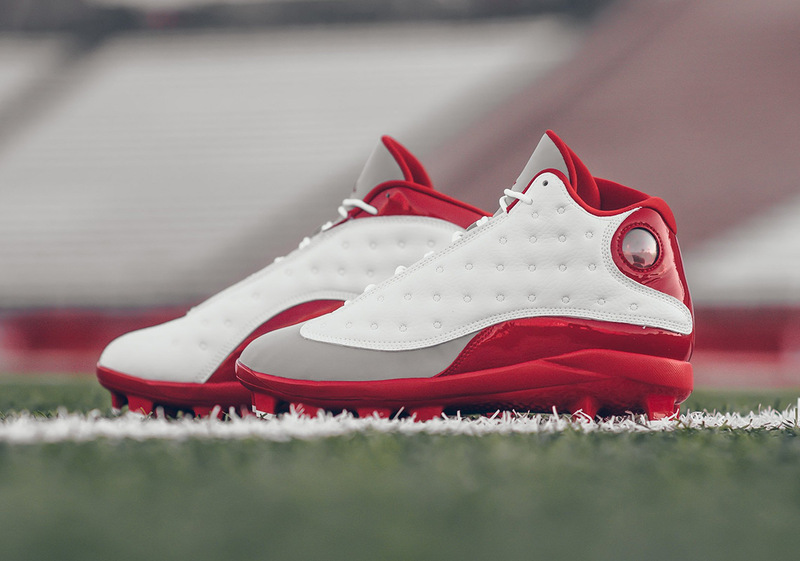 Jordan Brand cleats are nothing new to the gridiron. For years, we have seen the likes of Thomas Davis, Dez Bryant, and Joe Haden wear familiar looking cleats on Sunday afternoons, but for the first time ever, we have seen them with Jumpman logos this year. Unsurprisingly leading to an uptick in Jordan football cleats, the Nike sister brand has now added a “Grey Toe” colorway of the Air Jordan 13 Retro MCS to its football lineup. Sporting an identical color scheme to 2014’s basketball sneaker release, this new field-ready iteration with a molded outsole and cleated TPU ushers in a primarily Gym Red and White color scheme with light grey adorning its throat, toe, and lateral mudguard. Those looking for a little extra motivation to finish the football season strong can head over to retailers the likes of Sneaker Politics to grab these AJ13 “Grey Toe” cleats today for just $100 USD.